What seemed like stability on the club track turned into diabolical understeer on the big track at the CWIC. There is a chance it was tyre related because they are a few meetings old, and I reglued them as they were starting to tear away from the wheel, but I think it is fundamentally the suspension changes. Farewell Scyton, welcome back Scythe and Photon! Hard to give solid feedback because this isn’t a back to back test. But initial impressions are that the small changes in suspension geometry have given the car a LOT more rear grip. Normally at the Chippenham club track I would be running 85% steering lock on the Scythe and feeling as though it was on the edge of oversteer. With the Scyton, I was running 90% steering lock and feeling on the edge of understeer. Made a small change during the night to increase the front droop by 0.5mm to try and take some of the edginess away from the steering. Also had to raise the body up to clear the bumps in the carpet – not sure which change caused the improvement, but the car was better afterwards! Was I any faster? Not really. I finished in the same sort of place I usually finish with the same sort of margin to other drivers who haven’t changed cars (although there was one brand new XRAY 2011 which seemed to have given it’s owner a little extra pace). But I was more confident in the car, and that can only be an advantage. Here is the setup sheet – scyton_setup_initial_carpet_small – as ever, comments are welcome. …and I have named it the Scyton. Basically it’s a hybrid of the TOP Photon suspension and the TOP Scythe chassis and drivetrain. Why have I done this? Well, partly because I can (since I own both cars), and partly because I hope it will take the best bits of each car to make something even better. I like the simplicity of the Scythe; I like that the chassis has no undercuts beneath the motor and that the top deck is not countersunk for more consistent flex and tweak; I like the security of the servo mounting; and I like its light weight. But I have reservations about the suspension (borrowed from HPI). The hubs are incorrectly moulded with unequal toe; the roll bar drop links are tight and the geometry is prone to oversteer (probably due to the short camber link at the rear). 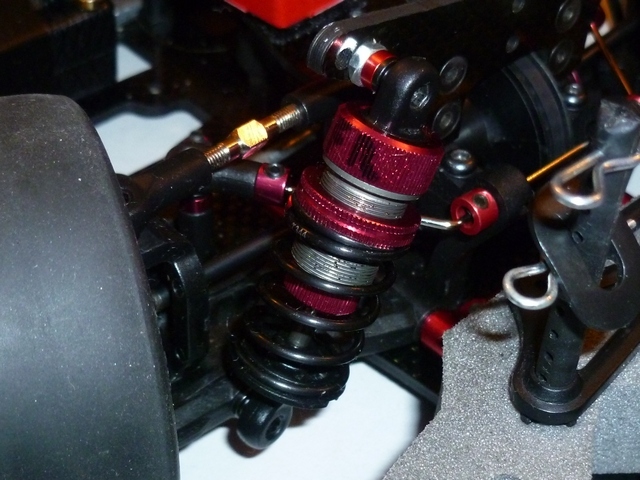 The Yokomo shocks are tricky to build consistently with the supplied diaphragms (Yokomo do now have some black rubber Tamiya-style diaphragms but I haven’t tried them). I like the suspension on the Photon. It is much more accurately moulded; strong; and operates smoothly. The rear geometry is better balanced, with a longer top link. The Tamiya-inspired shocks are plush and easy to build. But the chassis is over-complicated with too many components to come loose in a race, and arguably too many adjustments that you don’t need. It also has an undercut under the motor (on my 6-cell chassis, although the LiPo chassis has been changed), and a countersunk top deck which makes de-tweaking impossible. The servo mounting is far less secure than on the Scythe, requiring smaller mounts and a lot of extra spacers. Handling-wise, the Photon has a slight understeer tendency, the Scythe has a fairly strong oversteer tendency. I’m hoping that the Scyton will be somewhere in between. The anti-roll bar link does foul the inside steering knuckle at full lock and full compression - shouldn't be a problem on the track. Photon shocks and anti-roll bars are a direct fit. Scythe ackerman plate has been moved forward one hole. Photon ball ends are too chunky to fit on the Scythe bellcrank. 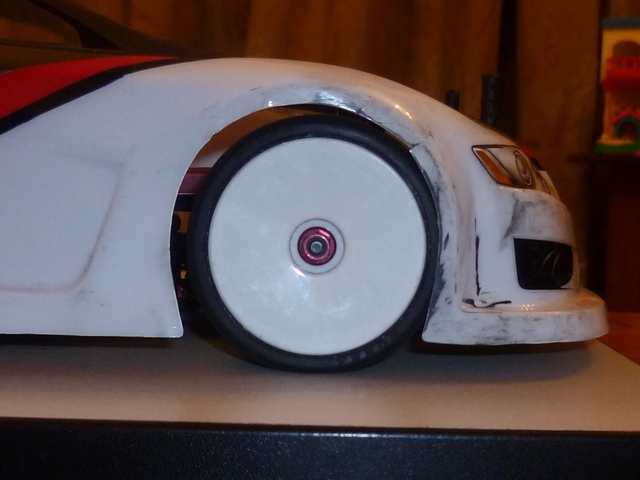 Shot of the front wheel arch, showing how far forward the Photon suspension moves the wheel. Starting at the front, the Photon arms have a forward sweep of about 2mm compared to the Scythe. To compensate for this I chose to move the ackerman plate forward by one hole to give straight steering arms again. 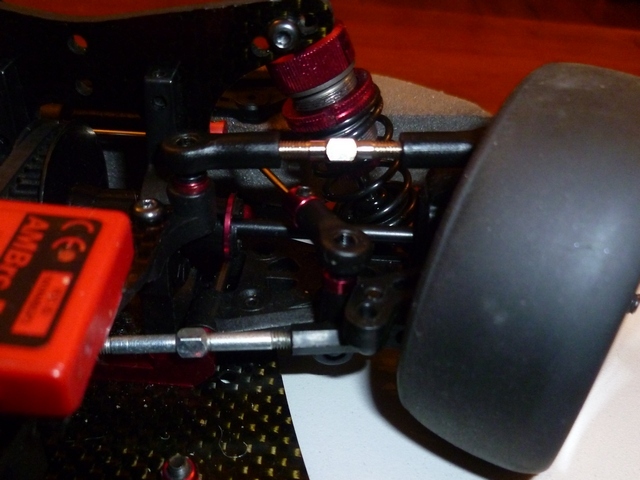 The Photon ball ends are too big to fit on the Scythe steering bellcrack, it is the only part of the conversion that requires the old Yokomo ball ends. The Scythe crank would be equivalent to the middle length and a theoretical “8” insert on the Photon. 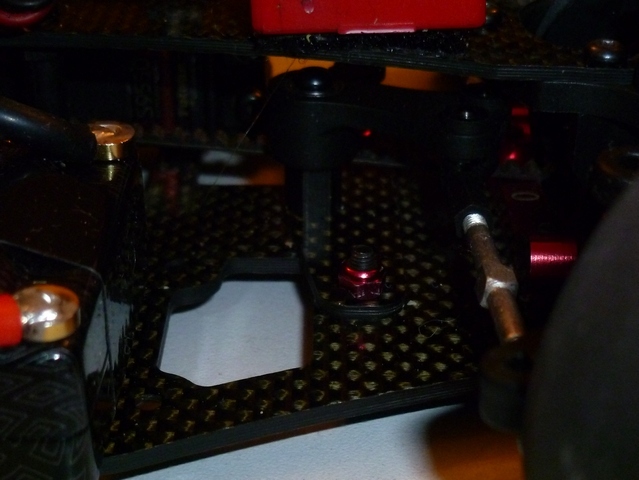 The Photon C-hubs are 0.5mm lower, so I removed 0.5mm from the inner camber links. The Photon suspension arms need a 0.5mm spacer and a couple of shims on the inner suspension shaft. 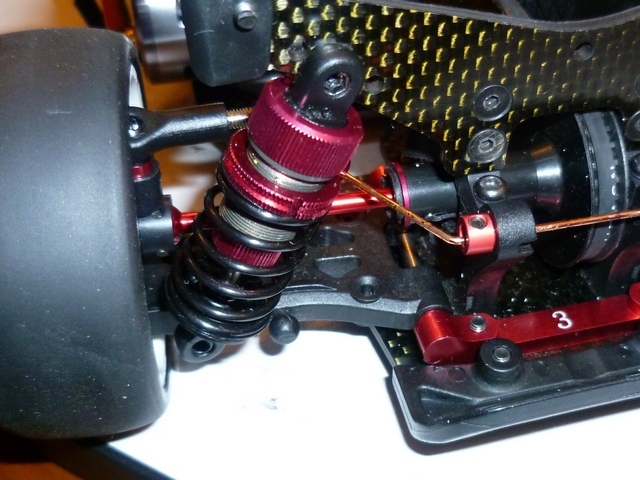 Shocks and anti-roll bars are a straight swap, although I have spaced the top shock mounting forward by about 4mm, and the anti-roll bar drop links foul the inside steering knuckle on full lock at full compression (shouldn’t be a problem on the track). Rear suspension is even easier to fit. Nothing to foul the drop link. Longer camber link should generate more rear grip. The rear arms are swept forward by 1mm. When you take into account the extra 0.5mm spacing required on the suspension shaft, the wheelbase ends up about the same, but the weight distribution has been moved back a tiny bit (0.5% or so!). The rear lower arms are 0.5mm shorter than the Scythe, but the top link is mounted 2.5mm further out on the hub, which should generate a better balance overall. The rear hub is 2.5mm lower than the Scythe, simply use a 2mm spacer though and it matches the front Photon hub geometry. Again, I am running 0.5mm less under the inner camber link. 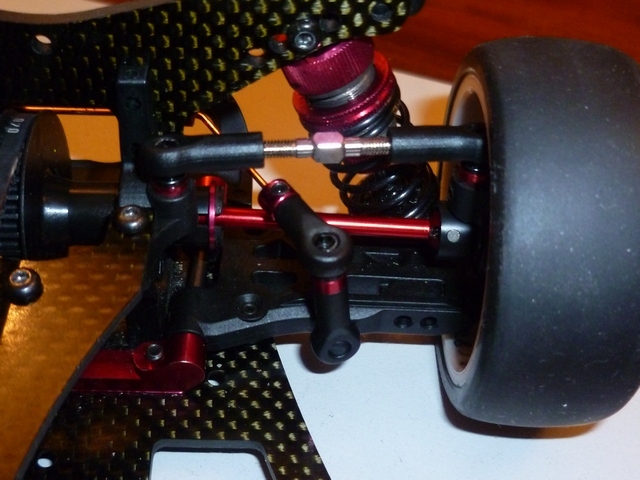 Photon driveshafts (46mm front and 44.5mm rear) appear to fit the Yokomo diffs perfectly. 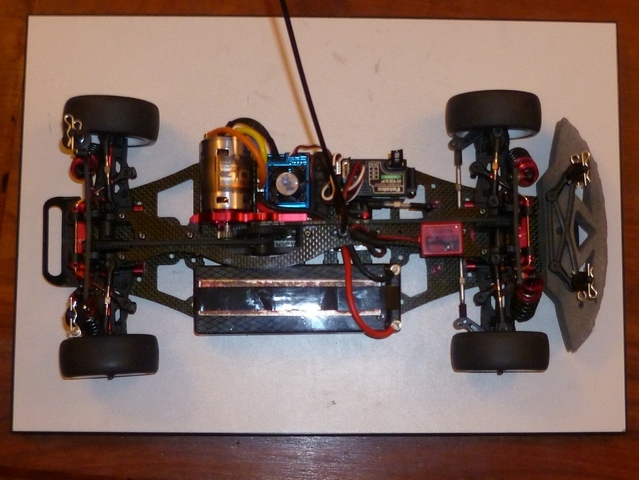 Car is now converted to brushless and LiPo. As you can see the Scythe comfortably fits brushless and LiPo technology. The LiPo has to be mounted outboard for balance – so the NiMH-shaped centre bulkhead of the Scythe is not a problem. Car needs about 15gm ballast to reach 1350gms with no fancy lightweight parts. I’m expecting the car to have a bit less steering than the Scythe, so for that reason I have put a basic Scythe setup on the car (0.5mm under the blocks, 2.5 front arm sweep), rather than the setup I have developed to tame the steering with the original suspension. Testing will prove whether the setup is right or not. Looking forward to it.